Comments: The Centurion went into service in 1945, but not in time to see action. This is Heroics & Ros' re-tooling of their Centurion 1, as it might have appeared if it had seen active service in Germany in the last months of the war. It mounts a 17 pounder main gun, and a co-axial 20mm Polsten auto-cannon which was discarded on later models as being too light for armoured targets and too heavy for use against infantry and soft-skins. 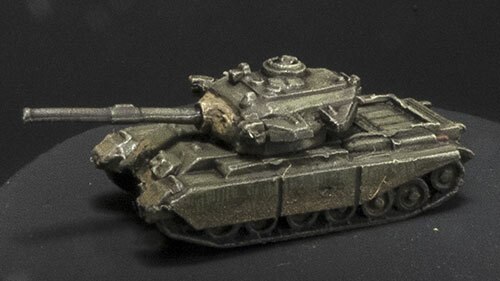 This is Heroics & Ros' old sculpt of the Centurion 1. 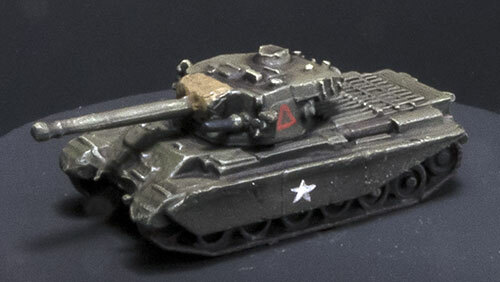 It was quite serviceable as a wargaming model, but as you can see it was nowhere near as refined as the new one. Again from Heroics & Ros, this one is the Centurion 3, the most common variant of the 1950s. It first mounted a 20 pounder gun, but was soon up-gunned with a high-velocity 105mm, as on this model. 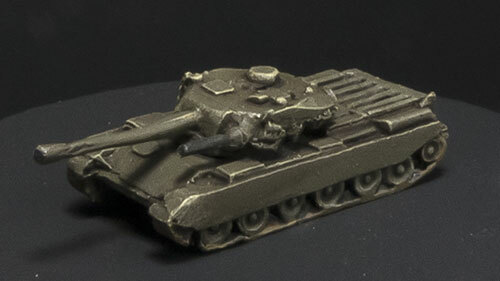 It first saw service in Korea, and was without doubt the best all-round tank of the 1950s and early 1960s. Variants of the Centurion are still in service in armies around the world today.